Do not expect that the GetLucky adware application will bring some luck for you. The program says it will find the best coupon codes for the goods you search for at the online retailers. Although it may look beneficial, this is a promise made by many advertisement-supported applications. Most probably, GetLucky will annoy you with its irritating commercial advertisements that you will encounter during your every Internet browsing session. In addition, this program spies on you, collects information about your online browsing tendencies, and can transfer this information to various unknown third parties. Therefore, we firmly believe that the best security-related decision is to delete the adware program from your PC. According to the official website of GetLucky, the application will notify you when there are discount coupons available for any goods that you purchase online. Even if you encounter an offer provided by this program that may look relevant for you, please resist the temptation and refrain from clicking on any content generated by GetLucky, because this program allows its business affiliates and third-party partners to display commercial advertisements. Even if the application warns you that you will interact with those parties at your own risk, it will take no responsibility for any unwanted results of such interaction. You will never know which of the ads or offers provided by GetLucky can be filled with a redirect link to an unknown website owned by an unreliable third party. Sometimes you may land on a corrupted website created for malicious purposes. Please note that the adware application may share information about your Web browsing habits with its business partners. The latter can use this information to generate personally targeted ads for you. So, the chances that you will encounter a relevant-looking advertisement are quite high. But once again, do not click on anything this adware program generates. Please be aware that creators of adware applications know about the possible usefulness of their products. Computer users with some experience will not fall for any promises those programs make and will not download them willingly, so the adware developers try to put their applications in software bundles. Thus, they hope to trick users who often use various file-sharing and free software download sites. Just show a little bit of inattentiveness during the installation of any program you received from those sites, and your computer may be filled with various unwanted intruders. So, if you have GetLucky on-board and do not remember purposely installing it, then it is necessary to conduct a full system scan to see if your system is not already infected by some malicious application. We do not think you should keep the adware application on your computer any longer. You will also need to clean your browser of the unwanted extension. 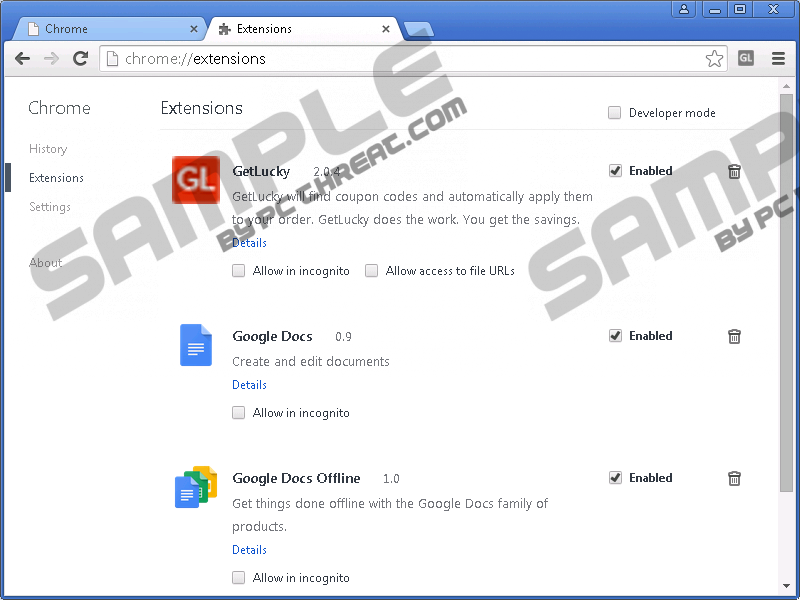 Our guide will show you how to remove the GetLucky add-on from Google Chrome or Mozilla Firefox and how to disable the unwanted extension from Internet Explorer. Please note that it requires skills of an advanced user to completely remove all traces of the adware program from your computer. We think you should not try doing that yourself. It is better to use a professional antispyware program. For example, we can recommend SpyHunter to you, which has proved to be a trustworthy and reliable defender against all kinds of computer threats. Do not hesitate to post your question if you need more information regarding the security tool we recommend, or if you have any questions about the removal of GetLucky. Simultaneously press Ctrl + Shift + A. Simultaneously tap Alt + F.
Click the trash bin icon near the unwanted extension. 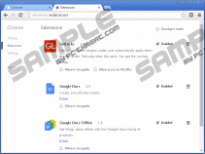 Go to Toolbars and Extensions and disable the unwanted extension. Quick & tested solution for GetLucky removal.